The Dipsea Race: The oldest trail race in America, begun in 1905, runs annually on the second Sunday in June. The race covers varied terrain on bucolic 7.4 miles of Mt. 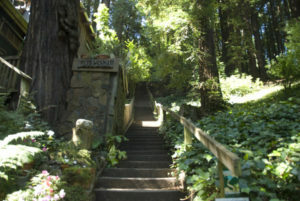 Tamalpais steps and trails from downtown Mill Valley over the mountain to Stinson Beach. The Mill Valley Film Festival, in October, is one of the most prestigious in the country. The Mill Valley Arts Festival, which occurs every September in the redwood grove of Old Mill Park, is a top-notch place to see the best in local art and crafts. Mountain Play Perhaps the best known of all Mill Valley happenings since 1913, the mountain Play is held every May-June in an open amphitheater on top of Mt. Tamalpais. You have the option of taking a bus to the play and hiking down through Cascade Canyon in the late afternoon to the town square. Tuesday Art Walks On the first Tuesday of most months, the Mill Valley Arts Commission hosts a walking tour of art gallery openings. Concerts in the Plaza Each Sunday in August, the Mill Valley Arts Commission presents free concerts at Lytton Square in downtown Mill Valley. Rhubarb Review, an annual variety show since 1954, featuring singers, dancers, parodies of film and television, and political and cultural humor. In 2018, it will play for four nights on May 6, 7, 13, and 14. The Outdoor Art Club, in a 1904 Bernard Maybeck-designed building, is at the crossroads of downtown Mill Valley. The club is available for rent for public and private events. Sweetwater Music Hall is available for private events, with or without music, supported by an excellent kitchen. The Mill Valley Community Center has a large reception room for 285-400 guests plus smaller meeting rooms. Muir Woods Park Community Clubhouse accommodates up to 75 people with full kitchen facilities. Ralston White Retreat was designed by San Francisco architect Willis Polk and completed in 1915. This grand house accommodates a large number for receptions, weddings, and meetings. There are overnight accommodations for up to 55 people. The location high on the Middle Ridge is spectacular. 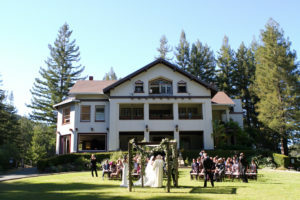 Mountain Home Inn on Panoramic Highway and adjacent to Mount Tamalpais State Park hosts weddings, receptions, and parties. The dinning rooms at the inn look over Mill Valley and the bay. There are 10 guest rooms.